There has been a good deal of discussion recently regarding the use of dental CT scans. As with any x-ray, the pros and cons must be weighed to determine when the use of a scan can best serve the interest of each individual patient. CT scans themselves offer a tremendous amount of information as compared to a typical dental x-ray. Depending on the type of procedure being planned, this information may enhance the safety and accuracy of the procedure itself. 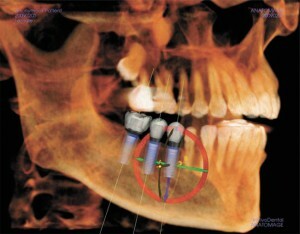 Traditional dental x-rays (along with “panoramic x-rays”) offer a 2D image of a 3D structure. In essence, the flat x-ray shows everything compressed on each other without providing any detailed spacial relationship information. Imagine buying an un-sliced, cinnamon raisin loaf of bread and laying it on a counter. Looking at the loaf from the side, if we were to try and identify where the raisins inside were located, it would be impossible. In addition, determining how deep the loaf was from that angle would also be impossible (unless you cheated and looked from above). This example is comparable to a dental x-ray that provides no true depiction of depth. If we were to slice the loaf and pull out a piece, identifying all aspects of the slice including the depth of the piece and the exact location of the raisins becomes possible. Similarly, a 3D picture of the jaw offers the ability to see “inside” the individual area being viewed. The exact depth of the jaw bone, any deficiencies, bone present, along location of important anatomic structures like nerves and the maxillary sinuses can be identified. In addition, some pathologic items such as lesion, tumors, cysts and tooth fractures may be evident. Traditional x-rays are fantastic for viewing tooth decay. In fact, the majority of traditional dental needs can be well served from a good, recent set of x-rays. When treatment planning surgical procedures such as dental implant placement, sinus lifts (a technique to enhance bone in the upper jaw typically for dental implants) or other similar procedures, CT scans offer the ability to determine exact location of nerves, sinuses and other anatomic landmarks so the procedure can be planned in the safest possible manner. Typically, ideal implant location and size can be determined prior to the actual surgery. CT scans may also reveal areas where procedures, such as dental implant placement, can be performed when previously thought impossible on a flat, 2D x-ray. Where is the Scan Taken? Typically, the scan is taken in the dental office and lasts approximately 1 minute. The image is usually taken only of the head, which minimizes radiation exposure significantly (in fact, the newer machines list exposures of only 1.8 x’s traditional panoramic films). You may also be referred to an outpatient radiology center if no in office scanner is available. The information offered in dental CT scans truly can provide tremendous information to your doctor, especially when surgical procedures are performed. Anatomic landmarks can be seen clearly, which allows these types of procedures to be performed with enhanced knowledge and ultimately can increase safety. Next What is Diabetic Macular Edema?